Marciello on pole, Rosenqvist and Lynn 2nd and 3rd respectively. At Macau this afternoon no amount of strategy was much use with a dirty track and a session that was plagued with so many red flag stoppages that it didn’t really get going until two thirds of the way in. And the upshot was pole position for Raffaele Marciello (88.com Prema Powerteam), the Prema driver having bided his time to the extent that many people must have wondered what all the fuss is about where “Lello” is concerned. 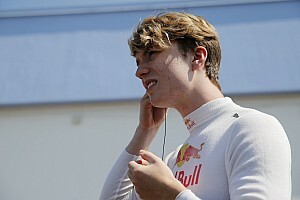 He was run a very close second by Felix Rosenqvist (Mücke), much as he has been all season in the FIA European F3 series. 3rd place went the way of Alex Lynn (Theodore Racing by Prema), the Englishman setting a faster time than that which put him on pole last year and finishing it was nowhere near enough on the resurfaced track. Marciello has saved a set of tyres for this second session but initially looked as if he would be hard pressed to actually use them. The session was late starting after a series of crashes in the previous sessions, and when the day starts to go that way at Macau it usually just gets worse and worse. And so it would prove. The screens were warning of slippery surfaces in the middle section but it seemed Katsumasa Chiyo (B-Max Engineering) hadn’t noticed. No one had actually managed a flying lap when the Japanese crashed out at Sao Francisco and brought out the first of the red flags. He’s investigated the barriers in every session so far so it wasn’t that surprising. The cleanup was achieved swiftly and the session restarted with around 24 minutes left. Maybe there would be some improvements. Maybe not. There were, but not many. Lynn went briefly fastest, only to be edged out by Luis Felip “Pipo” Derani (Fortec Motorsport), while Jazeman Jaafar (Carlin) managed a lap that put him 5th. The times were still in 2:12 bracket at this point, with Derani claiming 2:12.144, a neat 0.200 quicker than Lynn. The times were starting to tumble now and it looked like this might be an interesting session. However, Sun Zheng (Galaxy Double R Racing) had other ideas. He was off in the wall with Nelson Mason (Jo Zeller Racing) for company. Again they were removed very promptly but not before yet another stoppage just as Tom Blomqvist (Fortec Motorsport) went fastest of all. The order then as the wreckage was craned away was Blomqvist from Derani, with Rosenqvist in 3rd. Behind them came Lynn, William Buller (Fortec Motorsport), Antonio Felix da Costa (Carlin), Jaafar and Alexander Sims (ThreeBond with T-Sport), neither he nor Felix da Costa having yet managed to set a competitive time in this session. 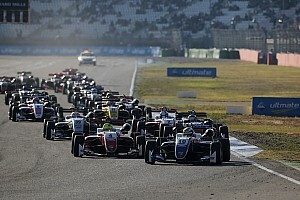 9th was Auer, from Marciello, Esteban Ocon (Prema Powerteam), Harry Tincknell (Carlin), Carlos Sainz Jr (Carlin), Stefano Coletti (EuroInternational), Yuhi Sekiguchi (kfz-teile24 Mücke Motorsport), Kevin Korjus (Galaxy Double R Racing), Antonio Giovinazzi (Double R Racing), Jordan King (Carlin), Nicholas Latif (Carlin) and Yuichi Nakayama (TOM’s). At the second restart, there was 16 minutes and a few seconds left and yet again no one managed an actual flying lap before the red flags were hauled out yet again! 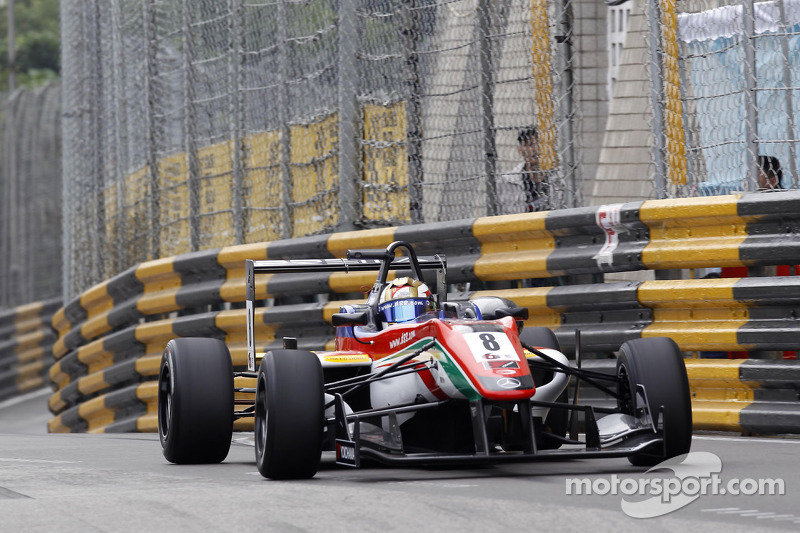 This time it was Giovinazzi in the wall in the middle sector. It was beginning to seem as if it was going to come down to sheer luck as to whether a driver managed time at all. They all duly trooped back to the pits and waited around again while the marshals worked their socks off getting the track back to rights so the cream of the F3 drivers could try and wreck it again! 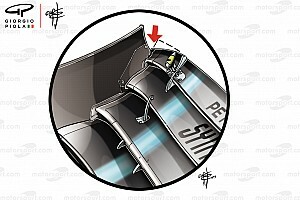 At what would turn out to be the final restart of the session, and with a little over nine minutes to play with, Sainz Jr promptly ended up running up the escape route at Lisboa, before parking it further round when the electrics let him down. The Spaniard was duly craned away and this time the session was not stopped. With around four laps maximum available in the time left to them, it was suddenly game on for everyone. And that was when Marciello struck. He’d already managed to haul himself up to 8th, and once the yellow flags for Sainz had been taken in, he was more than ready. Meanwhile, Lynn had improved to 2nd, only to have both Rosenqvist and Auer go quicker, the Swede claiming provisional pole. In the pack, Felix da Costa climbed from 7th to 3rd but the real surprise was yet to come when Marciello stole pole back from Rosenqvist. Having looked to be so relaxed as to be horizontal up to this point, pole position swam into focus for the Italian and he slammed in a lap that was almost two seconds faster than anything he’d so far managed. It was enough to boggle the mind, and makes it very clear just how good he actually is. However, so is Rosenqvist, and if there’s one quality Felix has in abundance it is dogged determination. Nothing short of tearing the wheels off was going to stop him trying to get the better of the Italian, and try he did. It just wasn’t enough in the end, the Mücke car just not quite having the legs needed to beat Prema. He lost out by 0.067 seconds. To ram the Prema point home, Lynn ended up 3rd from Auer in 4th. Afterwards Marciello still seemed relaxed: "I didn’t push at all in practice and qualifying 1 so I had fresh tyres for this afternoon and just made a good lap." Rosenqvist was ruing the last couple of corners, which he felt could have made a difference though he wasn’t that worried. "I had a really good slipstream for my fastest lap but in the last two corners I was a little too slow by about half a tenth for pole. That doesn't matter for the qualification race because to be in the top three means you can still be fighting for a win on Sunday." The final order was Marciello, from Rosenqvist, Lynn, Auer, Felix da Costa (who put in a late charge to move up to 5th), Blomqvist, Derani, Jaafar, Tincknell and King. Sims will start 11th from Buller, Korjus, Sainz Jr, Ocon, Latifi, Coletti, Sekiguchi, Wolf and Giovinazzi. 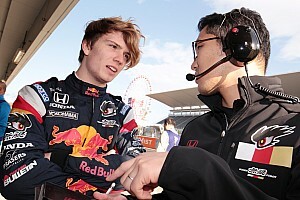 Yuichi Nakayama (TOM’s) and Ed Jones (Fortec Motorsport) will start from the back of the grid in 27th and 28th respectively after being penalised for engine changes. Meanwhile, Jazeman Jaafar (Carllin) has been hit with a demotion of five places for a yellow flag infringement in qualifying and will now start from 13th.